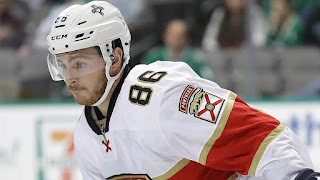 Forward Connor Brickley had two goals and an assist to help the Florida Panthers to a 5-3 win against the Nashville Predators at Bridgestone Arena on Tuesday. Brickley, a second-round pick (No. 50) by the Panthers at the 2010 NHL Draft, gave them a 2-0 lead at 9:28 of the second period and made it 3-2 1:43 into the third. Henrik Haapala, Michael Matheson and Denis Malgin also had goals for Florida. James Reimer stopped all 15 shots he faced; Harri Sateri replaced him midway through the second period and made 16 saves. Cody McLeod and Emil Pettersson scored 5:02 apart in the second period for the Predators. Viktor Arvidsson scored a power-play goal at 11:23 of the third to get them within a goal at 4-3 before Malgin scored into an empty net at 19:31. Juuse Saros made 23 saves for Nashville.